How does soap know what's dirt? How do magnets work? Why do ice cubes crackle in your glass . . . And how can you keep them quiet?They are the questions that torment all of us. 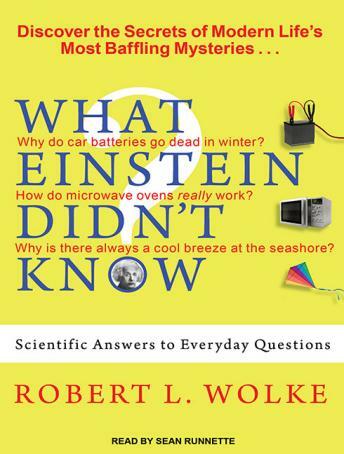 Now Robert L. Wolke, professor emeritus of chemistry at the University of Pittsburgh, provides definitive-and amazingly simple-explanations for the mysteries of everyday life. Shattering myths (such as the common belief that salt melts the ice in your driveway) . . . providing insider secrets (like what lights up a neon sign) . . . and daring you to perform your own experiments ( find out what happens when you use a sharp knife to scratch the inside of a beer glass filled with brew! ), Dr. Wolke provides astounding facts, cant-lose- bar bets, and sometimes shocking truths.Why is the sky blue? A candle flame yellow? Or bleached clothes white? Don't stay in the dark. When it comes to unraveling the mysteries of modern living, maybe Einstein didn't know. But you can-even if you've never lit a Bunsen burner-with this fascinating, eye-opening book about our astonishing world.